Added LVDS diff receivers for better performance and more sensitivity at low frequencies. Modified input amplifier to have better midband gain. 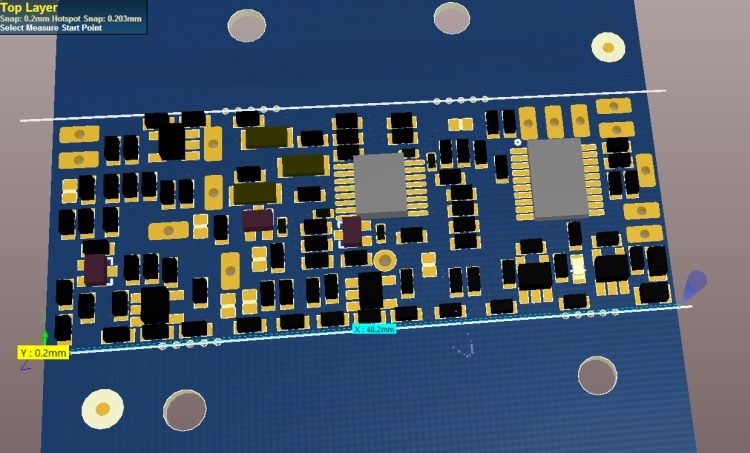 change to 2 layer PCB, 0603 and 1mm FR4. easier and cheaper to make…. H18-004 is the design for manufacture version, 50mm x 30mm, about 2mm high , 3mm in places. This project it a successor and in spirit of the XREF reflock device by David VK3HZ and Graham VK3XDK some years ago. Boards have not been produced for some time. The PCB has similar IO to XREF , and also has USB for programming and configuration, and a single multifunction LED. The main differences are that this project uses a fractional divider phase locked loop, so that it can provide locking for oddball rig reference frequencies, like 10.4868750 used in the FT1000, 41.344 MHz (IC-7300) , and maintain a high phase detector frequency for lowest PD noise. The board can be programmed for any reference input 5 to 50 MHz, though normally 10 MHz would be used from a GPS or rubidium etc. Although the chip will do up to 4 GHz (!!) , The board is designed for accepting 5MHz through 50 MHz as the rig reference, There is an amplifier on the PCB, and a logic slicer, as when using < 100 MHz inputs, the chip requires a minimum rise time, so a fast logic inverter is inserted in the rig reference chain. The amplifier can make inputs down to 50mV ptp work which provides some scope to sniff off not too much of the rig XO, and can operate 50 ohm or hiZ input if close to the internal XO. Up to 150 MHz the input amplifier and logic should still work with zero gain, so upwards of +3dBm would be required. Beyond that the amplifier/logic slicer should be bypassed and the PCB / chip combo is probably OK to 500 MHz. probably more if you are keen. The USB programming interface can load either firmware, or configure the dividers and the LED function. It is an STM32F0 processor in a TSSOP20 . Multiple regulators are used on the board to keep noise on the rails down to a minimum. Many input options are catered for with a handful of solder- jumper blobs that can be dobbed with a blob of solder, or not. Rig reference in : Min 50mV ptp at 20 MHz. Impedance selectable. Reference oscillator control out – goes Hi-Z on no reference input. This output is good for 0 to 5.2 Volts of swing. It can swing a VCXO directly like many rigs, or could swing a supply rail slightly for varying XO freq by that method. Vin : 7 to 15 V at 40 mA. Current draw depends on input frequency. USB DP and DN connections. Next work- similar board with 1 pps input rather than 10 MHz etc. 8 September committed H18-004 to mfr, rev 2.
stencil. upper and lower on the one stencil for proto.